What a perfect gift idea for the new grandparent to purchase a custom patchwork baby blanket for the new baby. No running to stores or hauling home packages. On-line shopping gives you access to dozens of options, and you can deal with the quilter who made the quilt. Because all cotton keepsake baby quilts are unbreakable, shipping is carefree. Equally important, a personalized keepsake baby quilt is one of the most unique keepsake handmade baby quilts or baby shower gifts you can give the family of a new baby. Additionally, your baby’s name in pink or blue on this “Animal I Spy” Baby quilt designed to be an excellent learning opportunity as well as the perfect combination of comfort and creativity to cradle your baby. 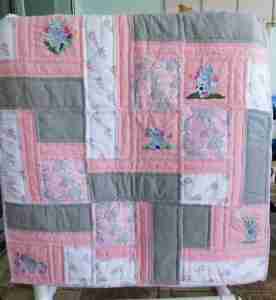 In addition, this long lasting keepsake baby quilt will be both durable and adorable. Important to realize, the Baby Quilt Lady offers a custom made baby quilt with a jungle animal theme for girls. Now you can give baby gifts that are not only beautiful and useful, but are also meaningful with a personal touch. In the same fashion, this handmade baby quilt will be a keepsake gift, not just one that will be tossed in a drawer and forgotten. In like manner, these 100% cotton flannel unique quilts for babies are hand quilted and will make the perfect unique baby gift. On the other hand, compare to the clothes that will be discarded, handmade baby quilts for boys and girls will last in numerous transmutations. “I Spy” a frog – in this keepsake handmade baby quilt. Did you ever see a baby start to learn to try to roll over? Wait, a baby on the hard floor! To put it another way, all babies need that special custom, one of a kind baby quilt. Babies need a soft place to lie on, and a place to be able to show off to grandma when you roll over for the first time. Similarly, unique keepsake handmade baby quilts are soft, cuddly, and can be a wonderful touch and feel blanket, as well. What gives these crib quilts that added special touch? The fabric is called minky, which is luxurious and silky soft. This fabric, which is perfect for minky baby quilts, resembles the real mink in touch. This short pile is as soft as cashmere. When mixed with the 100% cotton baby flannel in my quilts the look and feel adds a extra softness. All things considered, Moms and Dads, Grandmother and even Grandfathers, you need to make sure your grandchild has a soft and fluffy unique handmade baby quilt. Be sure when you watch that little one roll over or play with their favorite toy on the floor, that a baby quilt is in use. 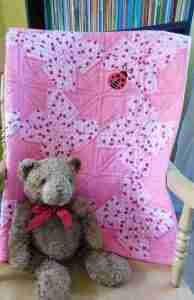 Handmade baby quilts are not just for cuddles! Generally speaking, when the floor becomes the baby’s playground, the well-loved quilt makes a great play mat, keeping her safe from the surface below, and keeping that surface protected from the baby’s activities. Meet Cuddles. He is the unique Teddy Bear from Unique Baby Quilt Boutique that you see pictured in many of my quilts. Along with the softness of Cuddles comes the perfect combination of comfort and creativity in each of my unique handmade baby quilts. Each is designs to be both durable and adorable. Just like Cuddles and other Teddy Bears, these handmade baby quilts help to nurture and protect your baby. For the most part, good memories not only please the people who have them, but serve as a link to those who come next. Because they have been hand-crafted with great care and skill, these machine-washable and dryer-safe baby quilts are likely to be kept as keepsakes. Consequently, the original baby, who has babies of her own, can wrap her children in the quilt she loved. This new mother can tell them all the good things she remembers when it was hers. She’ll be conveying family history, revealing more of herself and sharing her family past with a new generation. In any event, Unique handmade baby quilts for boys will be an impressive gift now and forever. First, it will shine at the baby shower as a thoughtful and extraordinary gift. It will amaze the family as it stays with the child from his crib through his play days as a source of warmth and comfort and security. In like manner, his children will be wowed when Daddy’s quilt comes out of its box to make them feel warm and special and loved. And you, who gave that little one a unique baby quilt, will always be remembered as that special person whose gift is such a treasure and the best of the handmade baby shower gift ideas. In short, give the gift of a homemade baby quilt from Unique Baby Quilt Boutique and start making memories today. The Homemade Factor enriches the quilt’s persona. All in all, since each unique handmade baby quilt is the creation of a home-based quilter, her imagination knows no limit to the design’s composition. Perhaps little monkeys will cavort across the center of the field while palm trees and bananas form a whimsical border. That’s a great motif for animal lovers and families who make their homes in warm climates. Or perhaps the quilt-maker has hidden a match-up game in the bright-colored patches that comprise the field. And how did she decide to join paw prints with pelt prints and jungle creatures in such an innovative way? Are you looking for quilts for a new baby? 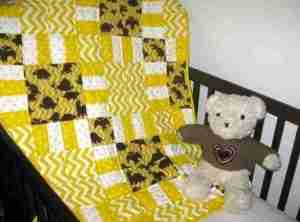 Or teddy bears wrapped in quilts for a newborn? 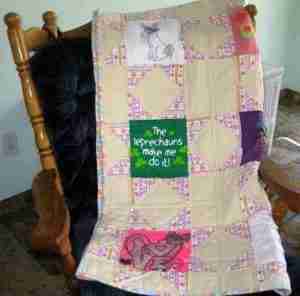 That, quilted patchwork blanket for boys or girls is the perfect baby shower gift idea. A new arrival – wrap the little one in a gift that will last a life time – a handmade baby crib quilt. Celebrate the new addition to the family with a handmade baby quilt that is made to be softer the more it is washed and machine dried. For this reason, these memorable unique handmade baby quilts will be treasured gifts for the mother-to-be and will treasured keepsakes for years to come. They are great for baby bedding, coordinating crib bedding in the baby nursery, on the floor or playpen, or for the Mother on the go in the car or stroller. Use these handmade quilts for children to enjoy during nap time, playtime or just time to cuddle with their favorite book during story time. On the whole, when are looking for just the right handmade baby quilt for sale, consider the colors, textures, and the unique design that you will find in each quilt from Unique Baby Quilt Boutique. Shop the boutique to find a one-of-a-kind baby quilt for your next baby shower gift or gift for the new mother-to-be. If you are searching for a different look, a pattern that you will not find in any store or on any shelf, look at the beautiful unique handmade baby quilts for boys and girls. Each hand quilted patchwork quilt is crafted with love for your next baby gift idea. Visit our Quilt Boutique to find just the right unique handmade baby quilts for sale to give to that special someone in your life. Each handmade baby crib quilt is loving handmade by me, Sharon, a Mom of four, and a new Grandma, who knows what babies want and need. My unique handmade baby quilts are the perfect combination of comfort and creativity to cradle your baby. All baby quilts are handmade to be both durable and adorable. Carefully cared for, as is your baby, these baby quilts will last for a lifetime. A lifetime of beauty and warmth, protecting and nurturing your baby. Need a unique baby shower gift? Just can't think of a baby shower gift? Expecting a baby or just had a newborn? A new arrival? Celebrating a new addition to the family? A unique handmade baby quilt from Unique Baby Quilt Boutique is the perfect gift idea. Snuggle close… A handmade quilt, with the soft to the touch quilt binding, is the perfect way to snuggle close with your child and a good book, as you instill in them the love of reading. As a quilter, these homemade and handmade baby quilts are created to help Moms and Dads cradle their child, hold them close, and keep them warm. A handmade quilt is a true gift of a lifetime. Teachers remind you to read with your child. Even if you are a Mom, who is waiting for your baby to be born, sit down, pick up a book, and read to your unborn baby. The baby can hear your voice even before he or she is able to cuddle in your arms in a handmade baby quilt and listen to you read to them. Children grow all too quickly. Stop washing dishes, cleaning the house, and blogging on the computer. Find a homemade and handmade baby quilt from Unique Baby Quilt Boutique to snuggle close and read to your baby.